It has been 36 years since the horse racing community has produced a “Triple Crown” winner – a horse that wins the Kentucky Derby, the Preakness and then the Belmont Stakes. This year many people thought it would happen. California Chrome, a horse that was owned by two newcomers to the racing community, won the first two races. One hundred thousand in-person viewers, as well as millions in front of their TV’s, were on the edge of their seats for the final race, the Belmont Stakes on June 7, 2014. Would it be a historical moment or not? Unfortunately for the history books, Tonalist, a 9-1 longshot, won the race. But the story goes way beyond the horses. It takes countless hours of training and practice to get the horses to their moment of glory. 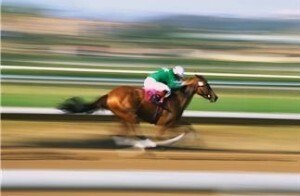 And in the final moments, no matter how well-trained the horses are, the victory is in the hands of the jockey. In the Belmont Stakes, would it be the Domincan or the Mexican jockey who brought the crowd to their feet? Many years before the 2014 horse races, Victor Espinoza was born on a dairy farm in Mexico, the 11th of 12 children. He loved riding horses, and at the age of 15 he traveled to assist his brother with training quarter horses. Later, at the age of 17, he paid for jockey school by driving a bus in Mexico City. By 1994, Espinoza had moved to Northern California and become the leading apprentice rider at the Bay Meadows and Golden Gate Fields racetracks. Fast forward to 2002, where he won the Kentucky Derby and Preakness by riding War Emblem. Again in 2014 he had the same two nationally recognized accomplishments riding on California Chrome. But once again, the day of the Belmont Stakes, Espinoza was to lose his bid for the Triple Crown. Espinoza’s challenger was Joel Rosario, a Dominican who had enrolled in jockey school and had his jockey’s license by the age of 14. He found his way to the United States and won his first Breeders’ Cup race in 2009, riding on Dancing in Silks. He came to national attention in 2013 by winning the Kentucky Derby on Orb. After numerous other nationally recognized appearances, Rosario ruined Espinoza’s Triple Crown quest by winning the Belmont Stakes on Tonalist. Americans were enthralled by this contest between two outstanding immigrants!